The Place You’ve heard us now. We promised to check it out this month and there was absolutely no regrets. If I were to list one hidden gem in Orchard road, this is it, The Sushi Bar. Nestled at a corner in Far East Plaza, I would label this one year old joint as the Tim Ho Wan of the Japanese cuisine as it has been drawing snaking long queues recently. We were lucky that we did not spend a long time queuing as we deliberately chose to go after 8pm on a Saturday, with the downside risk that some items on the menu may be sold out by then. If I were disregard the surrounding shops, I do feel like I am patronising a hole in the wall Japanese restaurant in Japan. The seats are pretty limited which explains the regular waits, which can be as long as 45 minutes during peak dining hours. The Food What draws me here is the value for money options on the menu, as well as the high quality of the food. The sashimi is one of the main draws here, which can be in the upscale range as the tip top seasonal sashimi such as Otoro (Fatty Tuna Belly) can go up to the range of the $40s depending on availability as well. Otherwise, fret not if you are on a tight budget as there are plenty of value for money options, which we have gone with this time round. 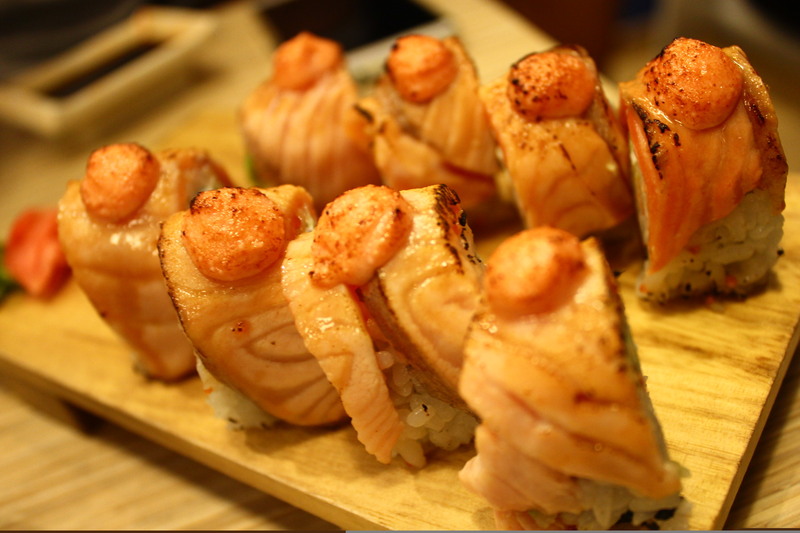 The Aburi Salmon Roll ($14.50) is one of the star dishes here which we simply could not miss out. The salmon is so well torched that I can feel it melt in the mouth in one bite. 8 pieces is definitely a generous serving for the price tag. We were equally impressed with the Scallop Mentaiyaki ($13.90), with the thinly sliced fresh scallops laid out so perfectly. The 100g Sirloin Steak ($14.90) is a must order for steak lovers. The steak is grilled to a medium degree, while the sliced presentation makes it feel like a great tapas dish to have on the table. We love the Spicy Salmon Maki ($4.50) as well, especially the tinge of spiciness which does not seem too overbearing such that you forget the taste of salmon. The Salmon Ikura Don ($18.90) is one dish we highly recommend if you are a salmon lover. We reckon this is much more value for money rather than ordering the slices of sashimi as there are about ten slices of salmon sashimi, not so thinly sliced thankfully! The rice is definitely Japanese rice, unlike those served in certain sushi joint. We were craving so much for the Aburi rolls that we could not help adding the Ebi Fry Salmon Aburi Roll ($16.90) on the last order call. The taste is not much different from the Aburi Salmon Roll we ordered earlier, except for small pieces of fried Ebi wrapped in the rolls. It does satisfy our sushi cravings though! Rants We are aware the demand for the dishes on the menu is high, so we were not surprised at all when dishes we really wanted to try such as the Wafu Spaghetti, Chawamushi and Tofu Cheesecake were all sold out. Perhaps it is better if we were informed in advance on the unavailable dishes while queuing. The small seating capacity also means that be prepared to wait a great deal during peak hours. Will I return again? We love The Sushi Bar, period. Every dish is prepared to such high quality that we crave for more with every bite, till our stomach surrender. It is an unpretentious place for some really authentic Japanese food.